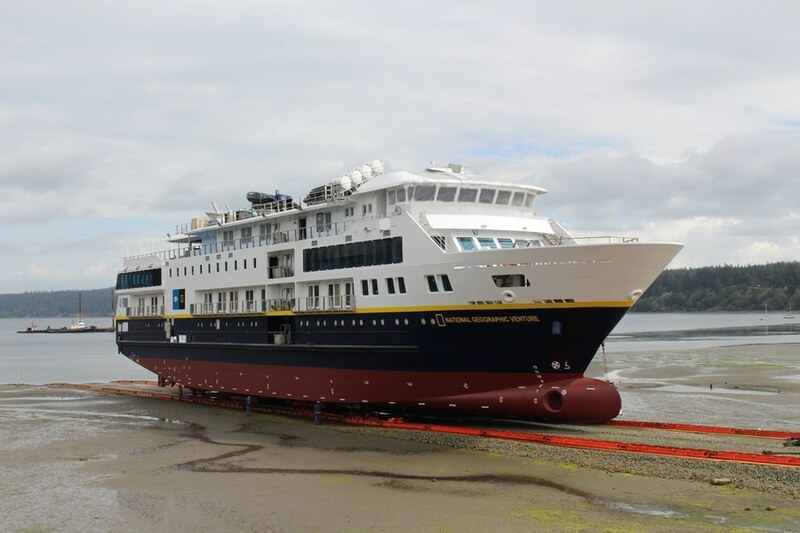 Nichols Brothers Boat Builders was awarded a contract by Lindblad Expeditions (LEX) in 2015 to build two new 238’x44’x10′, 100-passenger cruise vessels. The vessels, which have a steel hulls and aluminum houses, will do expedition cruises in coastal California; Baja, Calif.; Alaska; the Pacific Northwest, Costa Rica, Panama, and Belize. The first vessel, National Geographic Quest, joined the Lindblad fleet in July 2017. The second vessel, the National Geographic Venture, was launched Sept. 10 at Nichols Brothers shipyard in Freeland, Wash. The Jones Act coastal cruise vessels are purpose-built for expeditions, designed for exploring coastal waters, shallow coves, and fast-moving channels where wildlife congregate. The boats also feature 50 spacious cabins, open decks for wildlife viewing, and specialty tools for exploration, making them the ideal platform for voyaging in remote areas, Nichols Brothers said last year in announcing the delivery of the National Geographic Quest. 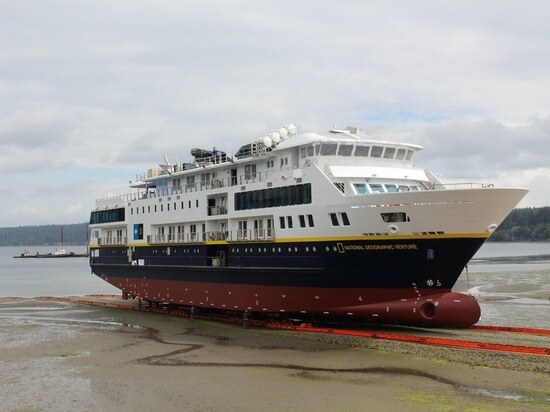 Designed by Jensen Maritime Consultants, the U.S.-flagged National Geographic Venture, which will welcome its first passengers onboard in November in San Francisco, will transfer to Nichols Brothers’s pier side facility in Langley, Wash., for final outfitting and sea trials, before being delivered to Lindblad in October. Main propulsion comes from twin MTU 12V4000 Tier 3 diesel engines, producing 1,600 hp at 1,800 rpm each. The mains connect to Wartsila 70″x80″, 5-bladed Nibral props through Reintjes WAF 332 marine gear, with 5.571:1 reduction ratios. The Venture and the Quest are fitted with a Schottel 170 thruster for added maneuverability. The propulsion package gives the new boats a running speed of 12 knots. The new Bureau Veritas-classed cruise vessels feature MTU Blue Vision controls and Jastram dual independent electric-over-hydraulic steering systems. Additionally, the boats are equipped with Toimil 12500 excursion boat cranes, Vestdavit TSB-2500 rescue boat davits, Marioff Hi-Fog watermist firefighting systems and G&O Br37000BG-G-BS MSDs (marine sanitation devices). Capacities include 53,130 gals. of fuel and 22,050 gals. water. The boats also carry a crew of 49 each. The electronics suite includes products from Furuno and Sperry. Following the Venture‘s launch celebrations in San Francisco, it will depart on two unique inaugural itineraries that explore the Pacific Coast, before Venture begins her seasons in Baja, the Pacific Northwest and Alaska.